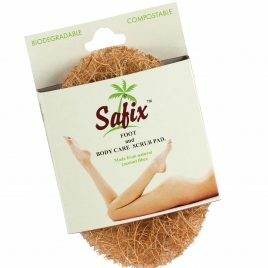 [icon icon=icon-circle size=14px color=#49a74d]SAFIX™ Scrub pad has the following advantages over the other available scrub pads in the market. [icon icon=icon-circle size=14px color=#49a74d]Made from 100% COCONUT FIBERS bound together with a non-toxic adhesive. [icon icon=icon-circle size=14px color=#49a74d]Lasts four times longer than any scrubbers available in the market. [icon icon=icon-circle size=14px color=#49a74d]Does not rust, splinter or degenerate on several uses. [icon icon=icon-circle size=14px color=#49a74d]Safe and soft for hands and nails. [icon icon=icon-circle size=14px color=#49a74d]Easily removes baked on, burnt and stubborn greasy deposits from all types of utensils. [icon icon=icon-circle size=14px color=#49a74d]Uses less detergent and scouring powder. [icon icon=icon-circle size=14px color=#49a74d]This scrub pad is surface friendly and will not scratch delicate surfaces. [icon icon=icon-circle size=14px color=#49a74d]Non-toxic. Odorless. No germs. No bacteria. [icon icon=icon-circle size=14px color=#49a74d]Made from 100% coconut fiber. [icon icon=icon-circle size=14px color=#49a74d]Lasts for several months. [icon icon=icon-circle size=14px color=#49a74d]Uses less soap but produces more suds. [icon icon=icon-circle size=14px color=#49a74d]Non-toxic. Odorless. No germs. No bacteria. [icon icon=icon-circle size=14px color=#49a74d]Safe for your hands. Gently deep cleans. [icon icon=icon-circle size=14px color=#49a74d]Removes residual impurities. Lightly exfoliates. [icon icon=icon-circle size=14px color=#49a74d]Refreshes & massages skin. [icon icon=icon-circle size=14px color=#49a74d]Most hygienic foot and body scrub pad on the market. 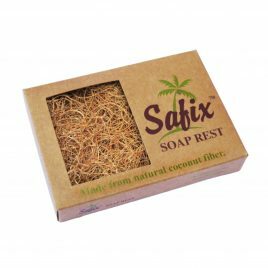 [icon icon=icon-circle size=14px color=#49a74d]The Safix Soap Rest is made from natural coconut fiber bound together with a non-toxic adhesive. [icon icon=icon-circle size=14px color=#49a74d]This Soap dish is an excellent soap rest in the sink, bath or shower. 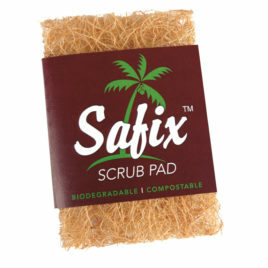 [icon icon=icon-circle size=14px color=#49a74d]Safix Soap dish pad allow water to drain and gets rid of the soap scum issue associated with conventional soap dishes. [icon icon=icon-circle size=14px color=#49a74d]It is very clean and can be used to clean the sink basin effectively without the need for cleaning products. [icon icon=icon-circle size=14px color=#49a74d]Soap dishes are a must when using soap. It keeps your soap dry in between uses and helps your soap bar last longer.